Figure A28. Carpathian anomaly, interpreted as the Carpathian slab, with (horizontal) [vertical] cross sections through (A)[D] the UUP07 p-wave) and (B)[D] the combined SL2013 and S40RTS s-wave models at 2710 km; C) the location of the modern geological record that we interpret to have formed during the subduction of the slab. 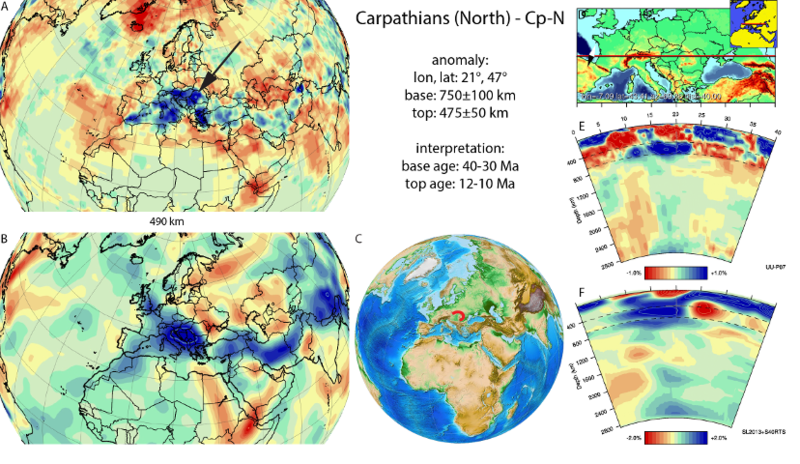 The Carpathian anomaly (Figure 28) is found draped on the 660 km discontinuity below the Carpathian oroclinal fold-thrust belt and its back-arc region, the Pannonian basin. It has been long known and is imaged in numerous tomographic models (Spakman 1991; Spakman et al 1993; Bijwaard et al., 1998; Wortel and Spakman, 2000; Piromallo and Morelli, 2003; Ren et al., 2012; Zhu et al., 2012). Apart from the southeastern corner of the Carpathian orocline – the Vrancea area, where a slab and associated Benioff zone are still imaged to be connected to the European lithosphere – the Carpathian anomaly is disconnected from the surface. The anomaly is interpreted as the Carpathian slab that resulted from westward subduction of Eurasian lithosphere below several terranes (Tisza-Datca and AlCaPa blocks) that became separated from Eurasia during Jurassic opening of the Piemonte-Ligurian Ocean (Schmid et al., 2008; Vissers et al., 2013) and that were deformed in a Cretaceous orogenesis unrelated to, and prior to the westward Carpathian subduction history (Csontos and Voros, 2004; Schmid et al., 2008). This westward subduction led to the formation of a thin-skinned fold-thrust belt – the outer Carpathians. The onset of this deformation occurred around 35±5 Ma (Matenco and Bertotti, 2000; Matenco et al., 2003; Gągała et al., 2012; Handy et al., 2014), and became associated with back-arc extension since ~20 Ma, opening the Pannonian basin (Horvath et al., 2006; Matenco and Radivojević, 2012), followed by arrest of shortening and unconformable covering of the frontal thrust system around 10-12 Ma in the northeastern Carpathians (Matenco and Bertotti, 2000; Gągała et al., 2012). We adopt the 11±1 Ma as the age of break-off of the Carpathian slab. Finally, we note that the northern part of Carpathians hosted by the AlCaPa terrane, north of the Periadriatic-Ballaton fault, underwent several hundreds of kilometres more subduction and extension in the Miocene than the area hosted by the Tisza-Datca terranes to the south (Ustaszewski et al., 2008). This suggests that the Carpathian anomaly is in fact composed of two slabs, separated by a transform fault, whereby the southern slab may still be connected to the surface in the Vrancea area (Figure 30). Our tomographic image, as well as that of Ren et al. (2012) appears to show such a disconnection between the two bodies below the Ballaton line.